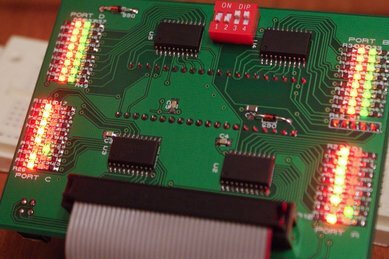 When it comes to debugging a microcontroller circuit, there aren’t a lot of simple options. Since a microcontroller circuit might have multiple things going on at the same time, measuring voltages with a DMM isn’t an option. Using an computerized In-Circuit-Debugger solution is expensive and elaborate, and time-consuming to set up. People often resort to connecting banks of LEDs to the circuit, but this also takes time and if wired incorrectly, might mislead you about the issues you are trying to solve. Enter the Microcontroller Debug Module (MDM). It is a device which simply transplants the microcontroller (MCU) to a separate unit, away from the breadboard. 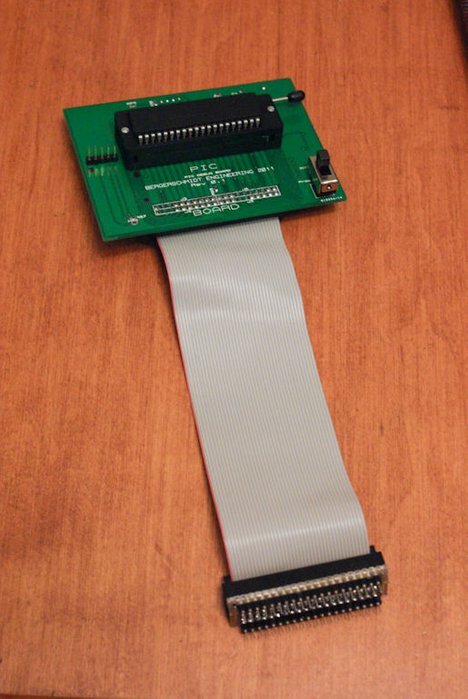 It is connected by a 40-pin ribbon cable to a small PCB which takes the place of the MCU on the breadboard, transposing each pin directly. No circuit modifications are required for the operation of the MDM. On the module are 74LS541 8-bit Line Driver ICs which drives indicator LEDs for each of the 8 bits on each of the data ports on the MCU. 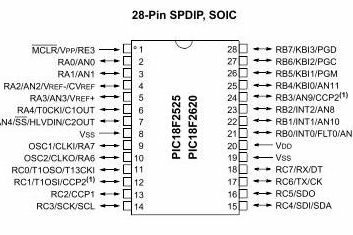 This chip delivers current for the LEDs without affecting the pin of the MCU itself. The pin and the breadboard circuit have no idea the chip is there. My microcontrollers of choice are PIC18 family 28 and 40 pin PICs which I have designed this unit to be pin-compatible for. Your unit can be designed for Arduino Atmel chips or any MCU you wish to use. This Instructable is mostly intended to inspire ideas and some circuit pieces to help you develop a MDM for your own favorite family of MCU. 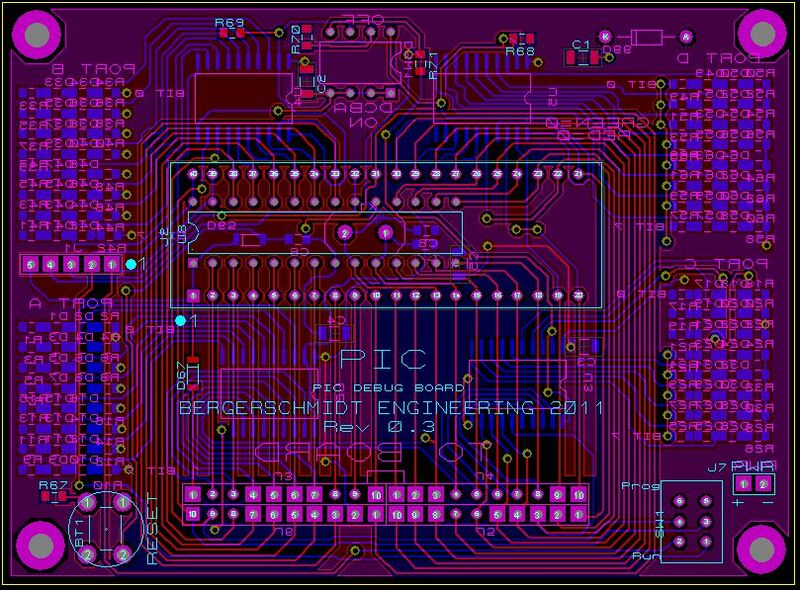 Also Please note the schematic and board layout are regarding Revision 0.3, it is far more advanced and has numerous corrections/features added to it, compared to Rev 0.1, which is photographed. 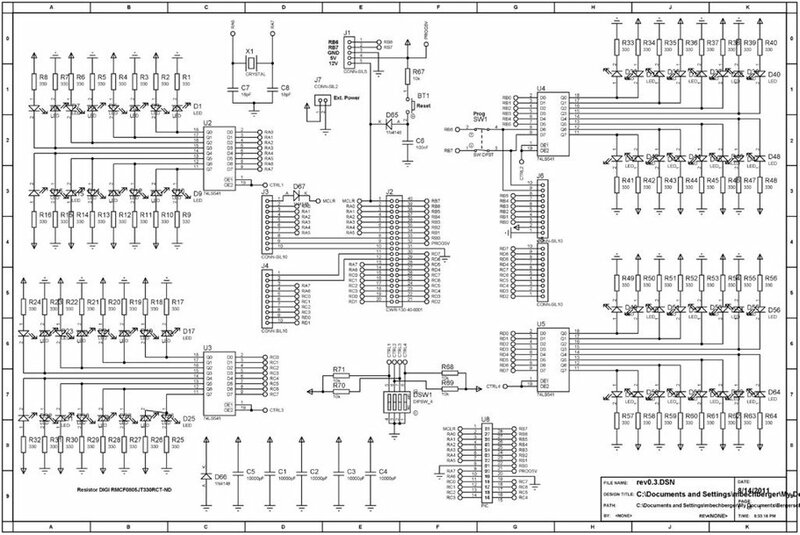 The schematic is large but fairly simple and can be broken down into some smaller parts. Each port has a 74LS541 connected to it which buffers and supplies current for 16 LEDs. A red LED has its cathode connected to the output pin and its anode ultimately connected to a +5V rail, and a green LED has its anode connected to the same output pin with its cathode connected to ground. The result is that when the PIC pin goes high, the corresponding 74LS541 pin does the same. When the pin is high the red LED has +5V on both sides of it, and thus will not light, but the green LED has +5V of potential on it now, and will light. When the pin is low then the red LED now has +5V of potential across it, and the green LED has GND on both sides of it and will not light. 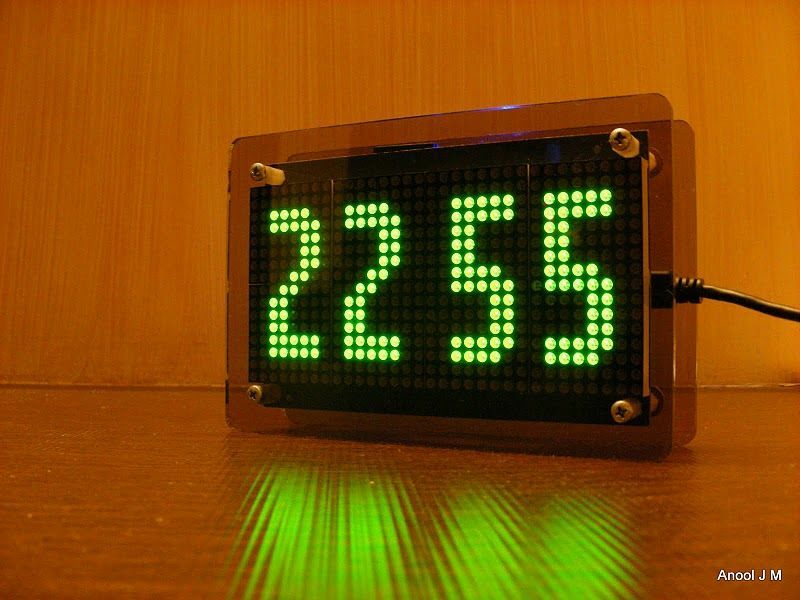 If the pin is rapidly switching from high to low, it will appear as if both LEDs are illuminated. Both LEDs would appear lit only in the event that the MCU pin is rapidly changing states, or if the 74LM541 has been disabled. DSW1 is a DIP switch bank that allows the user to disable or enable the LED output ports if they so wish to. It will reduce the brightness of the port LEDs if you are not using that port for anything, or if the port is being used as an analog input port. When the pin is Tri-state then both LEDs will light up at 50% brightness. Due to limitations of the 74LS541, when the MCU pin is displaying tri-state, it will display as high. The only time that the output of the 74LS541 will go tri-state is when the enable/disable switch for that chip is enabled. An oscillator is included on the board, and I recommend it be used because the crystal should be as close to the MCU as possible, and it is not a good idea for it to have to go through a ribbon cable to get there. It might also cause unwanted noise in the rest of the circuit and could affect ADC readings. 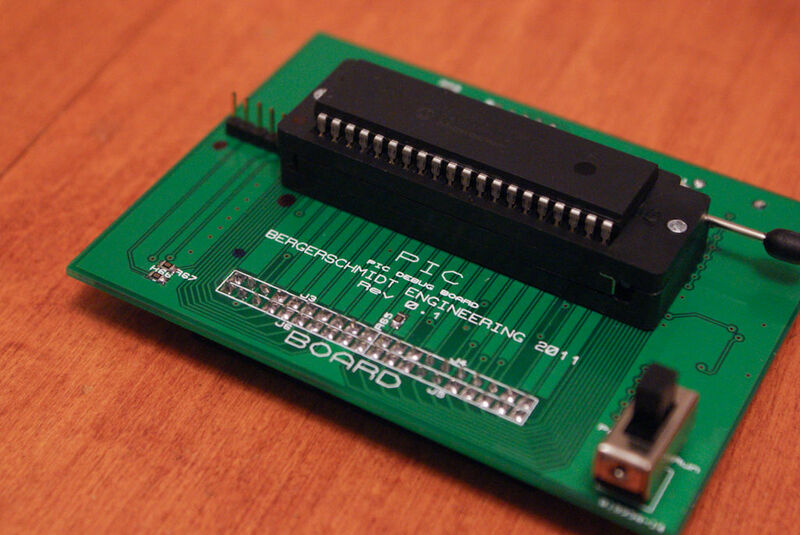 an ICSP header is included on the board, and can be enabled/disabled from the MCU pins with SW1. Please press the “i” symbol at the top corner of each image to view it in full, readable resolution. Thank you. I wanted to make my unit as small as possible so I squeezed it as much as I could, using SMT components, into a board that is about 3.5″ by 2.5″. It would be difficult, but not impossible, to make it smaller still. I am happy with the size however. I used the Proteus software package to develop my drawings and layouts. Eagle or another software package will work just as well. If you want to develop your MDM using through-hole components you might have a difficult time making it a manageable size, and might have some further difficulty if you want to use a single-side PCB. I have my PCBs done by a company called Seeed Studio for relatively cheap, since this kind of production is virtually impossible to do at home. This board would make a great SMT soldering practice project. The 0805 package size isn’t bad once you read some various techniques on the internet and test them out, and pick the one that works for you. Also a good hot iron with an appropriately small tip is important, and liquid flux makes life easier too. Once assembled the unit is ready to go. It can be used as a stand-alone device to test code, or inserted into a breadboard or PCB using the MCU substitution board. It gives an unparalleled visual connection to the circuit to allow you to develop code and debug issues at lightning speeds. The image of the MDM operating below is running a test program on the PIC which puts each pin of each port high one by one. Port D and port P in the picture are disabled by the DIP switches, you can see that both LEDs are on and are dimmer than the LEDs on ports A and C below. A great idea would be to develop a standard Arduino with this kind of circuit integrated right on the board! I am always open to suggestions about how to make this better, or what other features it could benefit from. Pleas feel free to send me a message or post a comment. Thanks very much for reading.